Here's what you need to know heading into Week 7 of fantasy play. 1. 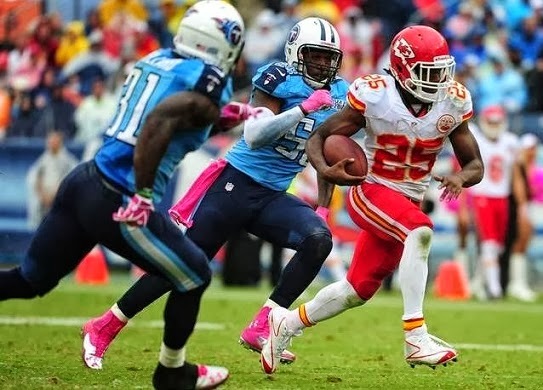 Jamaal Charles is the busiest back in the NFL. Charles has been one of the keys to success in Kansas City's 6-0 start. The 26-year-old already has 33 catches to go along with his 475 rushing yards. The frequentness of his end zone trips has been a major turnaround from last year. In 2012, Charles had 6 total touchdowns. Through Week 6 this season, he already has 7. Charles is on pace for over 1,200 yards and 10 touchdowns on the ground, and over 80 catches and 5 scores through the air. If he finishes with those numbers, he'll be the best fantasy back of 2013. 2. DeSean Jackson is playing well no matter who the quarterback is. Jackson is a guy you have to start every single week no matter who he's going up against. Last Sunday, he was opposite Darrelle Revis the biggest part of the game and still managed to score twice. For the season, Jackson ranks in the top 10 in the NFL in both receiving yards and receiving touchdowns. In every format, he ranks in the top 3 overall in WR points, making him one of the best fantasy values of the year, considering where he was drafted in most leagues. 3. Vernon Davis is getting back on track. After being a non-factor the first month of the season, Vernon Davis has reminded fans that he can still be a top 5 fantasy tight end over the last two weeks. The former Terp had 11 receptions for 268 yards and 3 scores in that span, including 2 catches for over 60 yards. San Francisco's passing offense has struggled most of the year, currently ranking 31st in yards. However, Davis could be the key for them in the second half of the season due to the lack of weapons they have on the outside. 4. Jordy Nelson's value is on the rise with a bullet. Injures to Randall Cobb and James Jones have now made Jordy Nelson the clear cut No. 1 receiver in Green Bay for the foreseeable future. Against the Ravens on Sunday, the 28-year-old registered 113 yards receiving and a TD, his first 100-yard performance since Week 1. Nelson was already a top 15 fantasy WR, but his value is sure to rise in the coming weeks. On a side note, Jarrett Boykin is another guy to watch for the Packers. He's sure to see a lot more snaps with the loss of Cobb and Jones. 5. Sam Bradford is in top 10 quarterback territory. No, your eyes aren't deceiving you. Believe it or not, in most leagues, Sam Bradford is either just outside the top 10 or just inside the top 10 in fantasy points for quarterbacks. He is currently ahead of such names as Tom Brady, Cam Newton, Andrew Luck and Robert Griffin. The main reason for Bradford's success is his +10 TD to INT ratio. Only Tony Romo (+11) and Peyton Manning (+20) have been better in 2013. Right now, Bradford is a perfect bye-week fill-in. You can't necessarily trust him to start on a regular basis because of the conservative play calling of Brian Schottenheimer and Jeff Fisher, but his numbers are worth watching going forward. *Catch me on Fantasy Football Live every Sunday morning from 8:00 till 9:00 on Sports Radio 560 WNSR Nashville, as well as 95.9 FM, or online @ wnsr.com.